Editor/Author Messent, Peter and Budd, Louis J. This broad-ranging companion brings together respected American and European critics and a number of up-and-coming scholars to provide an overview of Twain, his background, his writings, and his place in American literary history. 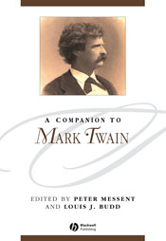 One of the most broad-ranging volumes to appear on Mark Twain in recent years. Brings together respected Twain critics and a number of younger scholars in the field to provide an overview of this central figure in American literature. Places special emphasis on the ways in which Twain's works remain both relevant and important for a twenty-first century audience.